All UMA content that provides a mesh is a slot. Slots are basically containers holding all necessary data to be combined with the rest of an UMA avatar. For example the base meshes provided are normally split into several pieces, such as head, torso and legs... and then implemented as slots which can be combined in many different ways. An UMA avatar is in fact, the combination of many different slots, some of them carrying body parts, others providing clothing or accessories. Lots of UMA variation can be created simply by combining different slots for each avatar. Slots also have a material sample, which is usually then combined with all other slots that share same material. Female eyelashes for example, have a unique transparent material that can be shared with transparent hair. 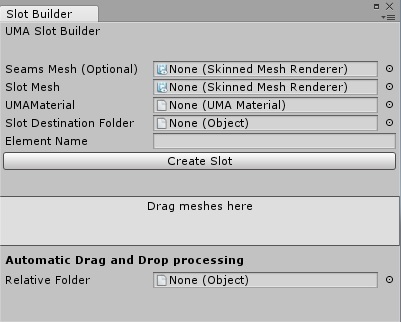 It´s necessary to set a material sample for all slots, as those are used to consider how meshes will be combined. In many cases, the same material sample can be used for all slots. 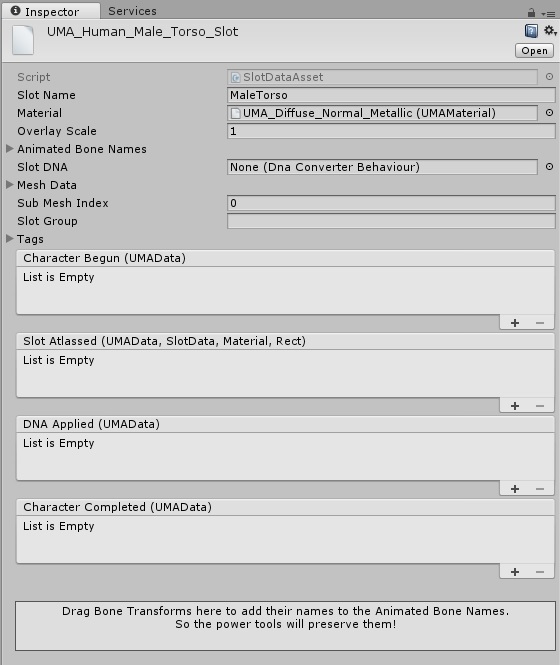 UMA standard avatar material uses a similar version of Unity´s Standard Shader, but UMA project provides many other options. The big difference between body parts and other content is that body parts need to be combined in a way that the seams won´t be visible. To handle this, it´s important that the vertices along mesh seams share the same position and normal values to avoid lighting artifacts. To handle that, we provide a tool for importing meshes that recalculate the normal and tangent data based on a reference mesh. Seams Mesh (Optional) - This pulls only the normals value off the mesh. Use this by supplying a unified mesh that spans seams so that the normals are consistent across the seam. It's not required if the slot being created does not span any possible seams. Slot Mesh - The skinned mesh for the slot. UMA Material - The UMA Material that this slot will be using. The standard is "UMA_Diffuse_Normal_Metallic". 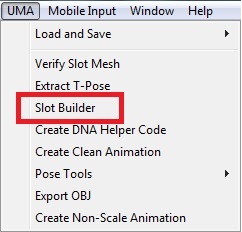 Slot Destination Folder - The folder in that a new folder for the slot will be created along with the slot asset. Element Name - The name of the slot. This needs to be unique! Overlays used in conjunction with slots. UMA Material for using other shaders. This page was last modified on 9 January 2018, at 01:33.